The kaleidoscope halos in a streetlight present some nomenclature problems. Please see the article Nomenclature Woes on my webpage (click the image above). I invite your suggestions for better names for the halos. This is great. We are still learning so much new stuff about the halos that we have start seriously thinking renaming them. The halo science is well and alive. Of course it is Walt who is doing this all, but at least we can provide him with some field material. As for Walt's invitation, darn, I don't have suggestions. Maybe brewing for a little while more will give some. But in any case, the latest pdf was again eye opener. Among other things, I had not really realized that the halo worlds around the lamp and the observer are identical (from outsiders view). it is really interesting when you think of halos as a 3D surface! 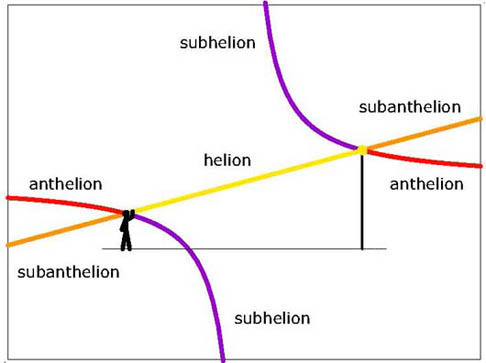 for new names, gosh... could we talk about alternate sub/ant/subant helion to distinguish between usual branch of the hyperbola and "new" branch? or maybe distinguish between observer side and source side of the halo world ("alternate" anthelion --> source side anthelion) ? or name after the type of reflections? distinguishing backward reflection (retroreflection) and forward reflection. and upper and lower reflections. "sub anthelion" --> "lower retro reflection", "alternate subanthelion" --> "upper retro reflection"
Thanks to Nicolas for lots of ideas, most of which had not occurred to me. And thanks to Marko for his good advice to go slow and let things percolate. I still do not see a solution that cries out with its compelling logic and simplicity.